It seems like you can't go to a film festival anywhere these days without national cinemas ending up in some kind of political stand-off. Whether or not one believes that a film festival is the proper venue to broker political agendas, programmers and audiences alike had best prepare themselves for what appears to be an increasing trend. Two Chinese films selected for the 21st Annual Palm Springs International Film Festival—Lu Chan's City of Life and Death (Nanjing!, Nanjing! 南京!南京!, 2009) and Ye Kai's Quick, Quick, Slow (超级50, 2009) were withdrawn early last month by the state-run China Film Group in response to the North American premiere of The Sun Behind the Clouds: Tibet's Struggle for Freedom (2010), a documentary by Ritu Sarin and Tenzing Sonam about the Dalai Lama and his trials and tribulations over an eventful year, including the 2008 protests in Tibet, the long march in India, the Beijing Olympics, and the breakdown of talks with China. 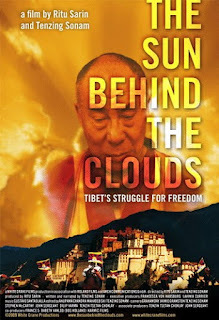 Commenting on the films, Festival Director Darryl Macdonald said, "After meeting with representatives from the Chinese government regarding their request to cancel our screenings of The Sun Behind the Clouds: Tibet's Struggle for Freedom, we have respectfully declined their request. I'm saddened that the Chinese film authorities have chosen to withdraw their films from PSIFF, as the Festival is an international cultural event whose mandate is to present a wide cross section of perspectives and points of view. That said, we cannot allow the concerns of one country or community to dictate what films we should or should not play, based on their own cultural or political perspective. Freedom of expression is a concept that is integral both to the validity of artistic events, and indeed, to the ethos of this country." As reported by the USC US-China Institute, a Chinese official reportedly told festival director Macdonald that since the US government recognizes China's sovereignty over Tibet, including Sun Behind the Clouds put the festival at odds not only with Beijing but also Washington. The Chinese official was right about official US policy, but naïve if he thought that festival organizers would worry about this. Macdonald told The Desert News that he replied, "Sorry, this is an arts event and we believe in freedom of expression." However, as USC US-China Institute's report emphasizes, programmers at PSIFF10 should have anticipated that China's leaders would see things differently. Mao's economic policies were jettisoned long ago, but his thinking on art still drives state policy. In 1942 he said, "There is in fact no such thing as art for art's sake, art that stands above classes, art that is detached from or independent of politics." In earlier instances, China pulled their films from the Melbourne International Film Festival after organizers there refused to drop a film featuring an interview with Uyghur dissident Rebiya Kadeer. Beijing accused Kadeer and the Uyghur World Congress of fomenting the July 2009 Ürümqi riots. In spring 2008, China's government blamed "the Dalai clique" for unrest in Tibet and pro-Tibet demonstrations hounding the Olympic Torch relay. Though neither Kadeer nor the Dalai Lama say they seek independence, Beijing calls them separatists. China's leaders see participating in festivals which also screen films they deem sympathetic to these individuals and their causes as consorting with anti-China forces. Participation is too important an issue, the leaders conclude, to be left to filmmakers to decide. Asked about the decision to pull his film, Lu Chuan told The Hollywood Reporter: "My feelings are very complicated. On the one hand I'm very grateful to the film festival for giving my film greater exposure, on the other hand, when it comes to Tibet and politics, we directors have no choice but to stand together with our film company." Lu added that he had "absolutely no knowledge" of the Tibet documentary. 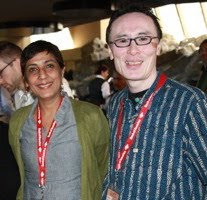 I felt compelled to ask filmmakers Ritu Sarin and Tenzing Sonam (Dreaming Lhasa, 2005; The Reincarnation of Khensur Rinpoche, 1992) how they felt about this development. Michael Guillén: With regard to recent events here at the festival proper, I'm curious if you were anticipating this conflict and if you have encountered such problems at other festivals? Rita Sarin: No, we didn't expect this kind of response. In the past, with another film of ours that we showed at the Toronto Film Festival, the Chinese consulate did call up the director of the Toronto Film Festival and said, "Would you please remove the film?" They said, "No" and that was the end of it. So we didn't really expect them to come all the way from Los Angeles and pull out the films. We were really shocked. In the current climate, it seems that the Chinese are flexing their muscles more than they have done because they are so economically strong at this point. It took us by surprise. We are very sad that the Chinese films couldn't come here and the Chinese filmmakers aren't present; but, I guess we have no choice because it's their government's decision and they can't do very much about it. Sarin: The first time we filmed the Dalai Lama was in 1986. Tenzing was the first Tibetan filmmaker to come out of the broadcast school at UC Berkeley. We were asked to film the Dalai Lama on his 1986 trip to Europe. Consequently, we did a lot of documentation with him. So, for example, when he won the Nobel Peace Prize, we were documenting that trip and his visit to Washington. So many many years ago before he was actually as famous as he is now, we spent a lot of time traveling with him. Over the years, of course, we've been making films about Tibet: about Tibetan Buddhism, about the Tibetan resistance and how the CIA was involved with the Tibetan resistance. We made a film about that. We've made many films over the years so I guess we know the subject intimately and I hope we can convey that because it's so complex. Sometimes when we watch our films, we sit here and think, "That makes sense to us but—if somebody doesn't know the issue—will they comprehend all the complexities?" Our challenge is to, hopefully, convey some of that. Tenzing Sonam: In Tibet there is a system of reincarnation and there are many reincarnate lamas, of which the Dalai Lama is the foremost; but, there are many other lamas. In the film you saw a young lama who is also a reincarnate lama. But the way the system works is that: when a lama dies, he is reincarnated again so he can continue the work that he started in his previous life. It's a lineage. It's a line. So you can't have a reincarnation unless the person has died. 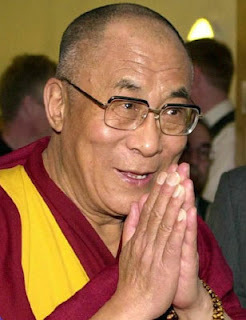 In the case of the Dalai Lama, when he passes away the search for his reincarnation will begin. What's happening now is that the Chinese have already put into place a law that says that they can select and approve their own Dalai Lama. Sonam: That's what he implied in his interview within our film. He said, "If I die as a refugee, then logically I will be reborn in a free country." Which means he will be born outside of Tibet. A precedent has already been set in Tibet. The second highest lama in Tibet, the Panchen Lama, remained in Tibet. He didn't go into exile. When he died, the Dalai Lama selected his reincarnation [Gedhun Choekyi Nyima], who was promptly whisked away and hasn't been seen since—it's been about 15 years—and the Chinese instead placed a boy of their own choosing [Gyaincain Norbu] and said he's the Panchen Lama; but, Tibetans call him the fake Panchen Lama. Sonam: Tibet was a feudal society in the past, which means that—especially in central Tibet—large areas were controlled by the aristocracy and by the monasteries. It was a less than ideal system, for sure; it was medieval. But what the Chinese are claiming now is that it was a cruel society where people suffered and the serfs had no rights. That is absolutely not true. For instance, my own mother comes from a serf family and was forced to work for an aristocratic family; but, her memories of her childhood are just of being very happy. Although the system was certainly in need of reform and I think the present Dalai Lama—if he had remained in Tibet—would have made these reforms, this Chinese justification for invading and occupying Tibet is absolutely not true. It's a colonial argument that all colonial powers have used, where they say the countries they have colonized are backward, underdeveloped, and need a colonial power to come in and "save" them. It's a classic justification. Sonam: That's what the Chinese say. However, the whole idea of a nation-state is a modern construct. It was only after the first World War that nations got this idea of nationhood. Before that, there were empires. China was an empire. China itself, at different times of history, was under the Mongols, under the Manchus. If you take their current argument further, you could say that Mongolia now has the right to say that China is part of Mongolia because they controlled China at some point. It's important to understand that, historically, there have been periods when China has been very influential in Tibet; but, I don't think there was ever a time when China physically controlled Tibet. As the historian in the film mentioned, between 1911 and 1950, Tibet was a de facto independent country. It had all the trappings of a nation. It had its own currency; it had its own postage; it issued its own passports. By modern standards, Tibet has every right to be an independent country. Sonam: This is a huge problem that Tibetans face now because, demographically, Tibet is being altered. As I mentioned in the film, all the big cities of Tibet have more Chinese living there than Tibetans. Of course, in another generation or two, these Chinese people and their descendants will be a part of Tibet. How do you then differentiate? It's very complicated. They've already done that in inner Mongolia and Manchuria, where the native populations are completely outnumbered by the Chinese. Sarin: The writer in our film references the presence of the Chinese and the changing of Tibetan culture. She's differentiating between the Chinese military threat and Chinese cultural imperialism. Even, for example, Tibetan New Year—which was a completely Tibetan festival—is now using Chinese products and customs. The customs are changing and the way of living is changing. Sonam: The US government supports the Dalai Lama's Middle Way approach and it has consistently prevailed upon the Chinese leadership to engage with him; but, in reality, the pressure they can put on China is nothing. If China chooses not to listen to them, there's nothing much they can do. Sonam: Dhondup Wangchen has been sentenced to six years in prison just last week. That's his crime: he filmed people's interviews. [USC US-China Institute expands: "Much less is known about the case of Dhondup Wangchen, a self-taught Tibetan filmmaker. Though they don't know what the charges were, members of his family say he was sentenced on December 28 to six years in prison. 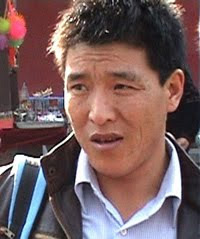 Wangchen has been in police custody since March 2008. He was arrested after violence broke out in Tibet and just after he passed more than forty hours of videotaped interviews with 108 other Tibetans on to a British citizen of Tibetan descent. Wangchen knew he was taking risks. He had gone to India in 1993 and met the Dalai Lama. Before he began filming, he sent his wife and four children to India. According to the website for Leaving Fear Behind, the short documentary he made using the interviews, he wanted to focus attention on Tibet during the run up to the Olympics. Wangchen argued that if China's government "really want[s] to preserve and improve Tibetan culture and language in Tibet then they should withdraw Chinese people living in Tibetan areas." The website with Wangchen's film is blocked within China. Sonam: Again, China sits on the UN Security Counsel and constantly blocks any legislation that it doesn't like. So there's no way the Tibet issue could ever come up before the UN. The UN is quite ineffectual when it comes to the big powers. Sonam: It's happening to a small extent; but, Tibetans and Chinese lead very separate lives and there's a very strong distinction made by both sides: "You're a Chinese. I'm a Tibetan." But, definitely, intermarriages are happening. Sarin: There are many things you can do in the United States. There are many organizations that are there to do something about the Tibetan cause. If you're a young person in a university there is Students to Free Tibet. It's worth joining one of these organizations. There are a lot of support groups all over the country. They all need support and help. Every single person counts finally in the long run. It's important to keep some sense of hope. Without hope you can't do anything. You have to keep hope for the future and work as much as you can. I know it's a very difficult situation. We are aware of that. But it doesn't mean one just gives up. Sarin: The Tibetan culture is being preserved fairly well in exile and in parts of Tibet. However, of course there are so many changes in the world now. For example, the monasteries used to survive because they were cut off from the world and people could practice Buddhism and their studies quietly and that's becoming harder and harder to do. On the whole the Tibetans have been a successful refugee group and have been able to continue their tradition and their cultural practices. Sonam: I think it was both. Obviously, the demonstrations in Tibet happened because they knew the focus was on China and that created a huge wave of sympathy and awareness all around the world; but, nothing came of it. It disappeared. And by the time the Olympics actually happened, Tibet was a forgotten issue. In that sense, we didn't capitalize more on the moment when we could have. 02/26/10 UPDATE: The PSIFF controversy has been expertly summarized at dGenerate Films. Further, as reported at The New York Times, Film Forum removed City of Life and Death from their spring calendar when National Geographic Entertainment, the film's North American distributor, advised they could not guarantee that a print of the film would be available in time for its scheduled release. In its stead, Film Forum has scheduled The Sun Behind the Clouds, adding one more layer to the existing tension between the two films. I'm keeping my fingers crossed that City of Life and Death will screen as scheduled at the upcoming San Francisco International Asian American Film Festival.